In this video, you learn how to make a Yarn Monogram using cardboard from an old box and other crafty things you have from around the craft room. It's a perfect way to re-use the old boxes from around the house and use what we have on hand. 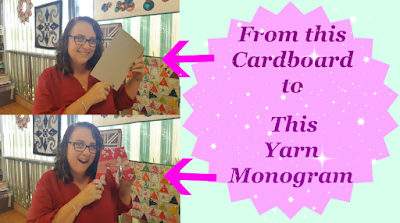 So join me in this step by step instruction How-to make a Yarn Monogram with Cardboard Don't worry if you don't have any cardboard to use from an old box. Cereal boxes work just as good, you may have to cut 2 extra letters. You can use Wooden letters purchased from your local craft supply store or just use the links below for the other supplies you need. if you like this video give us a Like or a Thumbs up. by clicking on the pink Social Hearts up in the right-hand corner of this post. you will find this just under the pink social media hearts.